U.S. publicly-traded tech company EPAM has been operating in Ukraine for the last 13 years. In this time, it has grown to become the country’s largest tech employer, with a staff of now 5,500 people. It’s a reflection of the company’s growth worldwide. 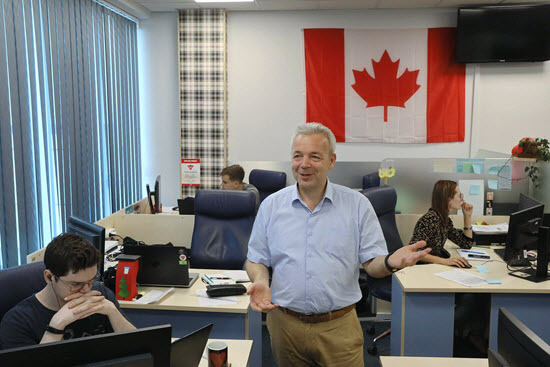 Founded in 1993 by two Belarus natives, EPAM since then has become a global provider of software engineering and information technologies consulting services with 26,000 employees and offices on four continents. This year, EPAM’s revenue hit $1.5 billion. Ukraine’s branch is one of the key ones. With its five offices in Kyiv, Kharkiv, Lviv, Dnipro, and Vinnytsia, it accounts for 20 percent of the company’s global revenue. For Ukraine, it means a lot of high-paying jobs. Already being the biggest tech employer in the country, EPAM Ukraine plans to nearly double the number of employees in three years. 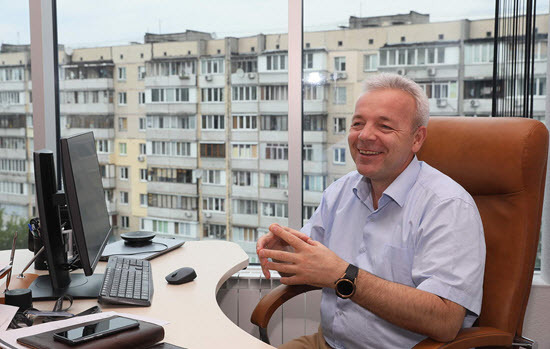 Creating as many jobs as possible is especially important to EPAM Ukraine CEO Yurii Antoniuk. For Antoniuk, the local booming IT industry is the answer to most Ukrainians’ sparse livelihoods. Managing Ukraine’s EPAM branch, he tries to set an example of how the industry can provide good, high-wage. He hopes other companies and industries will follow suit. If they don’t, no one will, he says the government “doesn’t think enough about creating jobs,” he said. “What our government is enthusiastic about is collecting taxes, fighting with customs or doing other (nonsense),” Antoniuk said. Today Ukraine has over 50 IT firms that employ from 320 to 5,500 people, with EPAM, SoftServe, Luxoft, GlobalLogic, and Ciklum as the top five, being responsible for around 20,000 jobs. Antoniuk thinks that by creating well-paid jobs for skilled workers Ukraine can finally break out of the “vicious circle” of low prices for goods and services in the country and low wages. And if the government is incapable of doing it itself, it should concentrate on letting business take care of it, he says. EPAM’s tech expertise has found its way into global giants like Oracle, Microsoft, Adobe, Google, Canadian Tire and British mass media agency Thomson Reuters. The company competes with tech giants like Accenture, Infosys, DataConsulting and even with auditors like KPMG and Deloitte. To grow its expertise and capacity, EPAM has been acquiring smaller software engineering and consulting startups. It’s bought 10 since 2012. At that time, there was a surge in interest in technology, said Antoniuk. People became more open-minded toward computers, and business started to see an opportunity in harnessing technologies to improve customer relations and operations. Soon, traditional industries like banking and retail understood that if they didn’t use technology, they would be outpaced by competitors. Many turned to firms like EPAM to transform. The tech business started to receive expensive orders. Antoniuk attributes part of this change to the success of the American electronic commerce and cloud computing giant Amazon, saying it set the example for other businesses on how to work via the internet. “Millennials, young people, were used to smartphones and tablets (starting back then). They didn’t care about going to offline (physical) branches,” Antoniuk said. EPAM opened its first offices in Ukraine in 2005, as demand for its services was increasing and the country offered cheap IT talent. Back then, their operation model was simple: match “Western thinkers with local doers.” They were hiring Ukrainian talent to do programming for foreigners. Later, however, EPAM changed its Ukraine business model. Apart from coding small projects for international and local clients, EPAM branched, offering design and consulting services and business expertise in different industries. Their first foray into banking was done with globally-recognized investment companies like Barclays and UBS. Today EPAM provides software solutions for various industries such as automotive, hospitality, retail, and media. Despite that negative global perception, EPAM’s Ukrainian offices do a crucial job for the company, securing 20 percent of EPAM’s revenue every year. Antoniuk hates the word “outsourcing.” Tech companies in Ukraine have passed the stage of being just contractors that made software for others as part of a product chain, he says. “When authorities and lawmakers say tech companies don’t create products in Ukraine, they sound silly, since creating products is exactly what we do,” Antoniuk said. Antoniuk says that EPAM has an advantage over its competitors as it can develop software very fast. “If you work at a standard level, you are not outstanding. But if you can make (software) fast, you’re different,” Antoniuk said. On average, the company completes a project in 6-9 months, Antoniuk said. Accounting now for about three percent of Ukraine’s gross domestic product, or $3.6 billion in 2017, the tech industry in the country is still far from reaching its potential, according to Antoniuk. He believes that the tech industry is uniquely positioned to boost Ukraine’s economy and make it more service-oriented.